Update: Amazon has now put the price of the TicWatch Pro back up to £219.99, but you may be able to find it for less from a variety of other retailers. Original story: It's not quite as cheap as we saw it on Black Friday last year, but the TicWatch Pro has been discounted as part of Amazon's big spring sale in the UK and it's a great price if you've been considering buying it. Often you'll be spending £219.99 on a brand new TicWatch Pro, but today it's down to £171.18. That deal is only running until 11:59PM BST on April 9 though, so you'll have to snap it up fast. You'll have the choice of either the black or the silver version of the TicWatch Pro. Both are restricted to a leather strap, so there's no silicone alternative for you to buy here. 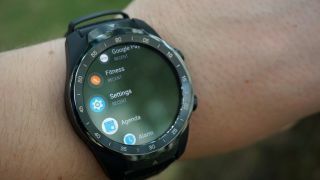 The Mobvoi TicWatch Pro may not be from a big name brand, but it sits in our list of the best smartwatches money can buy. We previously saw the watch sell for £164 on Amazon over Black Friday, but this discount isn't far off what it cost then and it's well worth considering as your next Wear OS watch.